Oscar-winning director, actor and musician Billy Bob Thorton, was recently interviewed in EQ Magazine (March 2003) about his studio The Cave. 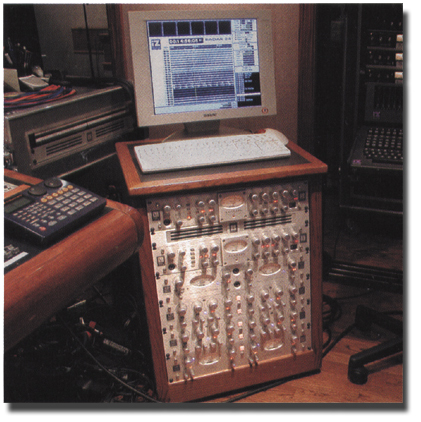 The Cave has a fully loaded rack of Avalon gear (2x Vt-737sp, 1x AD2022, 1x AD2044, 2x AD2055) shown above. In the interview Billy Bob talks about recording his vocals, "... I usually sing into a Neumann M149 and Jim (Mitchell) runs that through an Avalon 737, which works well because it has a little warmth and air around it, and that compliments what I'm doing..."
Artists that have recorded with Billy Bob at The Cave include: Slash, Warren Zevon, Dwight Yoakam, Billy Gibbons, Robbie Robertson, Daniel Lanois, Styx, Jewel, Marty Stuart, Ricky Medlocke and many others. 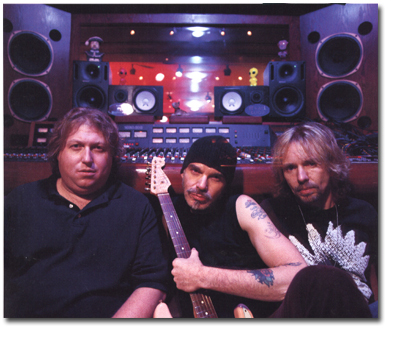 Engineer Jim Mitchell, Billy Bob Thorton and Styx' Tommy Mitchell in The Cave.